While many American TV- and film-related comic strips are well documented, often on individual sites, there aren't as many sites dedicated to individual British comics of the same nature. This page is an attempt to point researchers in useful directions as, so far as we know, there isn't as yet a dedicated central resource. As well as titles whose content was largely based on TV shows or similar, there were occasional TV-related strips in titles you might not think would have them - for example, Danger Man ran briefly in Valiant, drawn by Jesus Blasco. Girls comic Diana also featured a cracking Avengers strip. And of course almost every young kids show will have appeared in titles like Playhour, Robin, or in more recent years has had their own individual, licensed comic. There are several starting points for the British comics that are well known for featuring TV-related comic strips. A comic published by Amalgamated Press (later Fleetway) featuring the exploits of various comic actors. It ran from 1920 to 1962 and lasted for a total of 2225 issues before eventually merging into Buster. In 1961 it was retitled Film Fun and Thrills to emphasise that it was now running adventure strips, as well as reprints of American Disney comics. Radio Fun was a weekly comic published by Amalgamated Press (later Fleetway). It launched on 15 October 1938, incorporated Wonder in 1953, and was merged into Buster on 18 February 1961. As its title suggests it was a sister title to Film Fun, but using strips about radio personalities rather than film comedians. Amongst its features were text stories purportedly written by celebrities, but actually more likely to be from staff writers. A weekly comic published by Amalgamated Press. It was launched on 19th September 1953 as a sister title to Film Fun and Radio Fun. In 1959 it was renamed TV Fun and Romance in Pictures and was retooled as a romance comic. Later the same year it was renamed TV Fan, and merged into Valentine on 30 January 1960. Junior Express was first published by Beaverbrook Newspapers on 4 September 1954, later by City Magazines. It was re-named Junior Express Weekly with issue 39, then Express Weekly with issue 74, and finally TV Express with issue 286. Its last issue was no 375, dated 6 January 1962, after which it was merged into TV Comic. It had a similar format to the Eagle, tabloid with photogravure colour, with a mixture of comic strips and features. A weekly comic published from 1951 to 1984, originally published by News of the World. It was later sold to Beaverbrook and then to TV Publications, and was later published by Polystyle Publications after TV Publications was sold off. It was launched on 9th November 1951 and was the first British comic to be based around TV programmes. Possibly the most famous TV-tie in weekly comic published in the UK apart from Look-In. TV Century 21 (renamed TV21 in 1968) was published from 1965 to 1971, first by City Magazines and later by IPC. It was conceived by Keith Shackleton and Alan Fennell and originally emphasised Gerry Anderson properties, snagging the Supercar and Fireball XL5 strips from TV Comic. TV Tornado merged into it in September 1968. The following year it merged with the short-lived Joe 90 Secret Agent to become TV21 and Joe 90, a change which was accompanied by the issue number reverting to one. Strips based on TV series were gradually phased out, with Star Trek, often drawn by Mike Noble, eventually the lone survivor. In 1971 it merged into Valiant. A weekly comic for girls published by City Magazines, later IPC, and launched on 22nd January 1966 as a sister publication to TV Century 21, edited by Gillian Allan (partner of Angus Allan, who would later edit Look-In, until 1968, then by Chris Spencer. From issue 53 to 62 it was known as The New Lady Penelope, and from issue 123 to 204 it was called simply Penelope. It ended with issue 204, dated 13 December 1969, after which it was merged into Princess Tina. Lady Penelope, the character from Thunderbirds, had first appeared as a strip in TV Century 21, written by Alan Fennell and Scott Goodall and drawn by Eric Eden and John Cooper, before the TV series had even been shown, and led the new title, written by Alan Fennell and drawn mainly by Frank Langford, and sometimes by Michael Strand and John M. Burns. Other strips, mostly based on TV series, included "The Angels", a spin-off from Captain Scarlet and the Mysterons, "man from UNCLE", "The Monkees", "Mariuna, Girl of the Sea" (from Stingray), "The Beverly Hillbillies" and "Bewitched". • Shaqui le Vesconte's Complete Gerry Anderson Comics History is an invaluable resource on Gerry Anderson-related comic strips. TV Tornado A weekly comic published from 1967 to 1968 by City Magazines which was eventually merged with TV Century 21. Alongside reprints of US comic strips such as Flash Gordon it included originated strips such as The Saint and a variety of text stories based on TV shows. 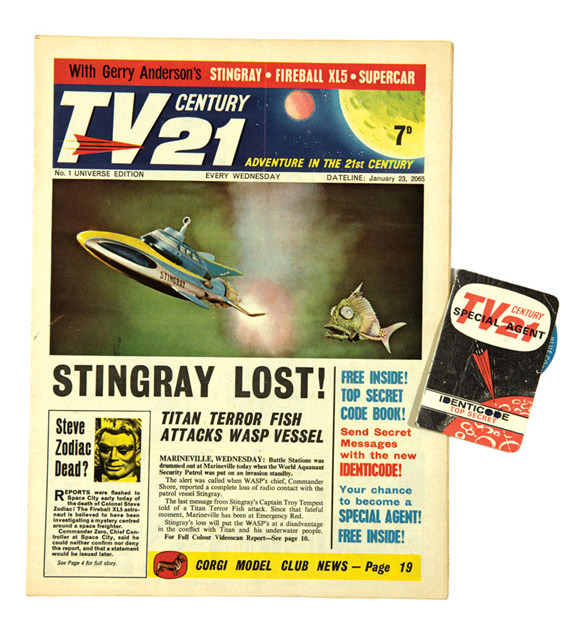 Besides TV Tornado, another similar comic was the short-lived Solo, which contained strips based on the Mysterons to acquaint readers further with the world of Captain Scarlet.Solo merged with TV Tornado prior to the latter's own merger with TV21. Joe 90, Gerry Anderson's youngest special agent in the world, first appeared in comics in his own title, Joe 90, launched by City Publications on 18th January 1969. The comic which also featured a British Star Trek strip, ran for 34 issues before merging into TV21, where Joe continued to appear. Countdown (later retitled TV Action + Countdown and then simply TV Action) was a weekly comic put out by Polystyle Publications from 1971 to 1973. 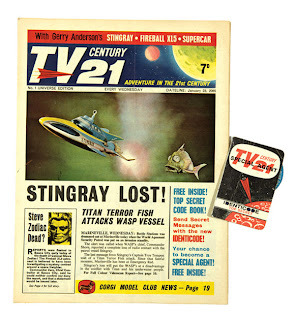 Edited by Dennis Hooper, it featured strips based largely on science fiction TV series, and was intended to ride a contemporary wave of interest in the genre. Features on technological advances were also included. In 1972, following a perceived decline of interest in science fiction, the comic was renamed TV Action + Countdown, signifying a general swerve towards the action genre. In January 1973 TV Action no longer contained references to its old Countdown name. The following September it merged into TV Comic. A weekly children's magazine published from 1971 to 1991, first by Independent Television Publications and later by IPC. Strips included The Tomorrow People, Robin of Sherwood, Space:1999, Six Million Dollar Man, The Bionic Woman, Sapphire and Steel, as well as comedy and pop band-based strips. Beeb was a short-lived weekly comic published by Polystyle Publications in 1985. As its title suggests, the comic was based around BBC TV series and as well as strips, it included features starring celebrities such as David Icke, Erkan Mustafa, Gary Glitter and Michael Jackson. The comic lasted only twenty issues. Colin Shelbourn, editor of rival publication Look-In, blamed this on a lack of promotion from the BBC.